The dishwasher lab and the cooking and refrigeration lab are our two main reliability test labs. We started the dishwasher lab in 2003 and the cooking and refrigeration reliability lab in late 2005. Before we created the labs, product engineering did their own testing. At that time, product engineers weren’t using PLCs, and testing products manually was burdensome, so we needed to build several automated test stands for testing components to be used in dishwasher designs. By automating the test labs, we aimed to reach several goals as outlined in Table 1. We needed to standardize test procedures to facilitate compliance with industry standards, and to improve product testing in general. We wanted to cut test time, and to reduce labor requirements. Automatic recording of test data was another goal, as this would allow analysis and improvement of test procedures. Finally, better test data would enable us to improve our product designs. To reach these goals, we began using PLCs for reliability test stands. An electronics engineer working on dishwasher products suggested using DirectLOGIC DL06 PLCs from AutomationDirect. We found that the AutomationDirect PLCs were simple to use, economical to purchase, and that they could measure everything we needed to test the dishwasher components. When the time came to build more test stands as well as start the cooking and refrigeration lab, we turned to AutomationDirect. 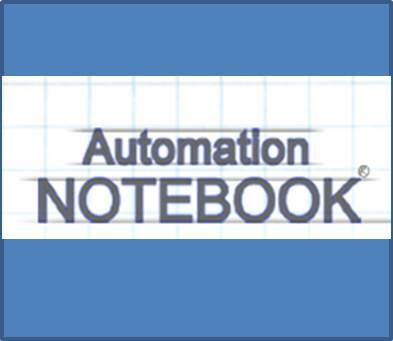 We continue to use AutomationDirect DL05 and DL06 PLCs in our test labs. We use both AC input and DC input versions of both PLC models. Other modules we use include thermocouple input and 0-10 VDC analog input. We typically don’t use analog or solid state outputs, but use relay outputs instead. Other AutomationDirect products we use include C-more 3-inch Micro-Graphic touch panel HMIs, DirectSOFT5 PLC programming software, and KEPDirect OPC software. In 2003, the design of a new dishwasher product started Viking Range on an evolutionary path toward creating reliability test labs and using PLCs to automate test-stand operation. The chief engineer on the dishwasher project wanted the major components tested to ensure a statistically high level of reliability. We created, designed, and built six test stands to ensure dishwasher components exceeded Association of Home Appliance Manufacturers (AHAM) and Viking Range standards for long-term reliability. AHAM is an ANSI-accredited standards development organization that develops and maintains technical standards for various appliances to provide uniform, repeatable procedures for measuring specific product characteristics and performance features. The components to be tested were dishwasher motors, drain pumps, water valves, soap dispensers, water heaters, and heaters/blowers for drying the dishes. We built a separate test stand or fixture for each of these part/component types, and each of the six test fixtures had the capacity to test 22 components. A DL06 PLC controlled each test fixture except for the water valve test fixture which used a DL05 PLC. We built the test fixtures to simulate how these components would be used in a dishwasher. For example, a water valve may come on for 70 seconds to put water into the dishwasher five times during a wash cycle. We used a PLC to control the timing cycle. When temperature or current measurements were required, we simply added an analog input module. Over the years, we’ve changed the test fixtures and PLC configurations to accommodate our reliability testing requirements. Today, we still use part of the original dishwasher test lab, but instead of the DL06 PLCs we started with, we use three DL05 PLCs. These PLCs are mounted on custom stands that test individual dishwasher parts such as soap dispensers and pump and drain motors. Other dishwasher life testing tasks we’ve added include a door cycle fixture for opening and closing a dishwasher door from 30,000 to 50,000 times (Figure 2); an upper slide rack fixture that tests a dishwasher’s upper rack by sliding it in and out; and a fixture that tests dishwasher water valves by cycling them on and off repeatedly. The primary dishwasher test lab has four dishwasher life test racks with 16 test stations for each rack. A test station is where testing of an individual product such as a dishwasher takes place, whereas a rack consists of multiple test stations grouped together. Dishwasher design engineering uses two of the four racks in the dishwasher test lab, and reliability engineering uses the other two. Each of the four racks has a DL06 PLC, and the two reliability engineering racks each have an additional DL06 PLC. The tasks performed by each of the four DL06s include keeping track of the number of completed cycles for each dishwasher; monitoring the test rack drain pump safety circuit; staggering dishwasher start delays when lost utility/facility power is restored; and energizing soap injection pumps at the start of each main wash cycle. The PLC for each rack receives a signal from each dishwasher at the beginning of the main wash cycle. The PLC subsequently energizes a small pump, which injects the appropriate amount of soap into the dishwasher. There are 16 DC pumps for each rack, one for each dishwasher. These pumps are external to the dishwashers as they are components of the test racks. The two additional DL06 PLCs control the two test racks that belong to reliability engineering, and control air cylinders that push dishwasher cycle and start buttons. The relay outputs of the PLCs operate air control valves, which, in turn, operate the air cylinders. To operate a Viking Range dishwasher, users must push control panel buttons while the door is open. We designed the dishwasher test stands with relays that simulate opening the door. We use small 4-inch air cylinders that physically push the wash cycle and start buttons. The air cylinders are positioned at the top of the dishwashers at each test position. Tests start every 2.5 hours, and continue to loop 24/7. Dishwasher current draw and power consumption are monitored using AC voltage and current transducers connected to an industrial PC. The main reliability lab—also known as the cooking and refrigeration test lab—is our largest testing facility. Here, we test ranges, wall ovens, cook tops, refrigerators, ice makers, and compactors. Our cooking and refrigeration test lab uses more PLCs than the other labs, with most of them monitoring range temperatures. C-more HMI, operate and monitor the range and wall oven door open-and-close cycles. The HMIs display the cycle counts, while the touch screen keyboard allows test engineers to reset the count. Some of the DL06 PLCs are configured to measure current draw of electric ranges and cook tops. AC current transducers measure the current usage monitored by the PLCs and collect data for graphing this current. DL06 PLCs measure temperatures of ranges, ovens, and cook tops under test. Thermocouples are attached to analog inputs cards. The PLCs are programmed to run repetitive cycles that turn units on for an hour then off for 15 minutes, for example. We log the monitored temperature data in Excel, with communications between each PLC and our three PCs via KEPDirect OPC software. OPC communications provides us with an easy way to transfer data using standard protocols. We quickly learned how to use the OPC/DDE server to collect data, and to write or modify macros in Excel to graph the collected data. Daily graphs show dips in the oven temperatures if there are issues or failures. This functionality allows us to run our tests continually, reducing total project testing time. We use RS-232 or Ethernet for these PLC-PC connections. We use four industrial PCs and three laptop PCs in the cooking and refrigeration test lab to log test data and to write test programs and profiles that run on the PLCs. 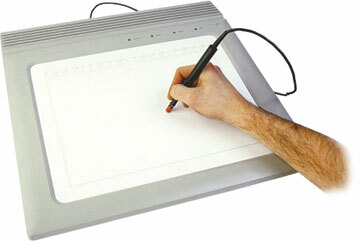 We also use these PCs as HMIs. We use DirectSOFT5 Windows-based PLC programming software to write or modify the test programs used to test appliances or component parts. For example, we recently created a program that tests three gas ranges in bake mode. The program repeatedly turns the ranges on for 30 minutes and off for 10 minutes. We’ve found the AutomationDirect PLCs to be simple to use, affordable, flexible, and highly reliable. Without much in the way of prior experience, we were able to learn how to program the PLCs in ladder logic programming using the product manuals and the AutomationDirect website. We found both the manuals and the website content to be very well-written and easy to follow. The optional analog input cards and the OPC communications to our PCs running Excel allow us to measure temperature and current without having to buy separate and expensive data loggers. The availability of both serial and Ethernet communication ports on the PLCs facilitated the required PLC-to-PC connectivity. The PLCs have enabled us to set up continuous component and product testing. We’ve been running these types of tests for more than seven years without any problems from AutomationDirect products. 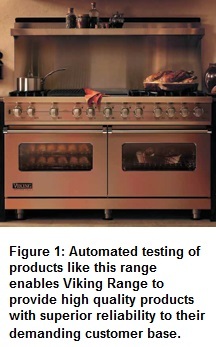 Due to our success with AutomationDirect products, Viking Range now uses DL05 and DL06 PLCs in two other manufacturing plants for monitoring and testing products.